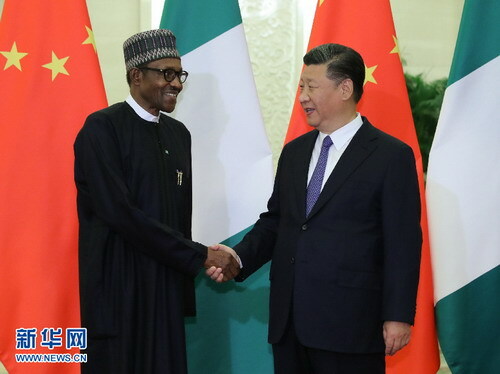 BEIJING, Sept. 5, Chinese President Xi Jinping on Wednesday met with Nigerian President Muhammadu Buhari who had attended the 2018 Beijing Summit of the Forum on China-Africa Cooperation (FOCAC). Thanks to the joint efforts by China and Africa, the summit concluded successfully, further enriching the China-Africa comprehensive strategic and cooperative partnership. It was a meeting with historic significance to China-Africa solidarity and cooperation, Xi said. Noting that Nigeria is a major African country and an essential partner to China in Africa, Xi said he attaches great importance to the development of China-Nigeria relations, which have reached a stage of growth unmatched in history. China appreciates the Nigerian government's commitment to the one-China policy and is ready to continue its mutual understanding and support with the Nigerian side on issues involving each other's core interests and major concerns, Xi said. Nigeria is welcome to participate in the Belt and Road construction. China is willing to deepen cooperation with Nigeria in fields such as infrastructure, agriculture and production capacity, enhance people-to-people and cultural exchanges, and support Nigeria's economic and social development so that the bilateral cooperation can become a model for China-Africa cooperation, Xi said. Buhari congratulated China on the success of the FOCAC Beijing summit. The FOCAC has become an important platform for creating a brighter future for 2.6 billion African and Chinese. Nigeria will work with other FOCAC members to implement the outcomes of the summit, he said. 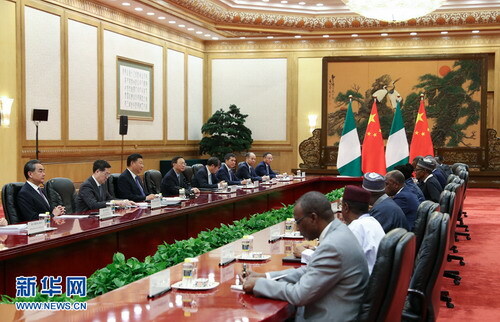 Buhari expressed gratitude to China for its concrete assistance to Nigeria's economic and social development. With China's help, Nigeria obtained a light rail, the first of its kind in West Africa, which fully reflected China's technology, quality and speed, he said. The Nigerian side appreciates the Belt and Road Initiative, which will lay an important foundation for Africa and China to achieve win-win cooperation and common development. Nigeria is willing to participate in the Belt and Road cooperation, he said. After the meeting, the two presidents witnessed the signing of cooperation documents.